When I was a kid and living up north, I used to beg my parents to let me travel to my cousins who were living in Stockholm. One of the many reasons for this was to visit the legendary shop SKO UNO. The store was founded in 1976 and has been at its current location since then. 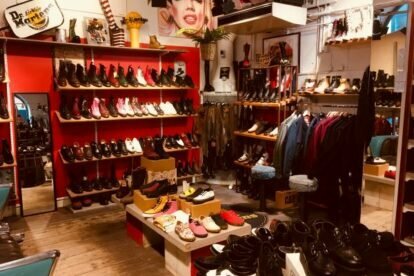 SKO UNO carries a wide array of brands, both well known such as Doc Martens, Replay and Vans, but that’s not why you should venture here when in Stockholm city. I once described the place to my friend as “the walk-in-closet of a cowboy, who loves RuPaul’s Drag Race and enjoys going for a run in the Hollywood hills on the weekend”. Hence, it’s a beautiful madness of shoes, leather attire and sneakers. You’ll find those bedazzled platforms fit for your inner Ginger Spice you’ve always yearned for, or why not treat yourself to a great pair of well-made Chippewa boots? As you’ve guessed, this place calls to your inner ’90s kid, but I assure you that all generations will find something to their liking here. Apart from being the quirky shoe heaven it is today, SKO UNO also sells leather jackets, jeans and mixed accessories that the owners think fit into the concept. If you don’t have room left in your bag, SKO UNO also offers worldwide shipping. A trip to Stockholm is not complete without stopping at the store at Gamla Brogatan 34, so just treat yourself to the experience.